Is it OK to re-upload externally hosted images on Stack Overflow's imgur? In my country imgur is blocked and can only accessible through VPNs. I can use VPN on my mobile or PC but can't use it while I'm at work, so if an image is uploaded directly to imgur, I can't see that but I can see images that uploaded via stackoverflow's upload feature (to i.stack.imgur). To show what it is like, this is what I see on direct imgur used answer (I used this because this is the latest I encountered). I can workaround it using image upload. After clicking Add Picture, now it's uploaded to i.stack.imgur and I can see the image. So, my question is, if I feel like to change it, is it OK to edit direct imgur links to i.stack.imgur ones without notifying OP or should I just see the image myself and move on? p.s. Couldn't find a better title, so feel free to change it. Also wasn't sure to post on meta.se or here. Is it OK to edit direct imgur links to i.stack.imgur ones without notifying OP or should I just see the image myself and move on? Yes, this is fine. There should only be a few old posts that you will come across that don't use the official Stack Overflow image-hosting service, hailing from a time before that service was available and well-integrated. Currently, someone would have to work extra hard not to upload to i.stack.imgur.com. You don't need to notify anyone. In fact, it's better if you don't notify anyone—you have full edit privileges, so just make the edit. Why waste two people's time? The only thing I would ask is that, while you're making these image-substitution edits, you also fix any other glaring problems with the post that you see. If the post has incorrectly formatted code, fix it. If a question is obviously mistagged, fix it. If the title uses horribly inappropriate grammar, change it. And so on. You don't have to fix everything if you're short on time, but taking care of the obvious issues will help to minimize the disruptive impact of edits. Not the answer you're looking for? Browse other questions tagged discussion edits images . Must we use Imgur for images? A method for users to include LaTeX math in questions / answers without MathJax — would SO devs be interested in adding this as a bespoke button? 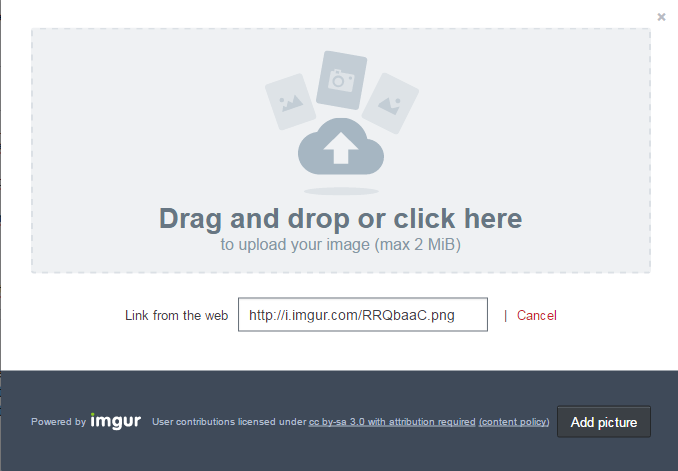 Why does Stack Exchange use Imgur to host images? How will Article 13 (EU) impact content on the Stack Exchange network?